Attention Trapshooters grades 6th to 12th. You are invited to compete in the 2nd Annual Shamrock Shoot. This event is open for all youth shooters at any experience level. 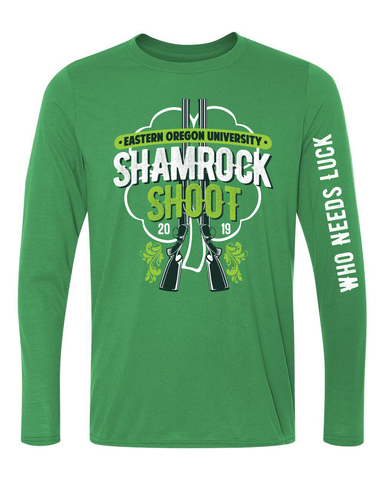 Registration fees are non-refundable and will be considered a donation to the EOU Trapshooting Program. Once you complete the online registration form, you can either mail in your payment or be contacted to pay with a credit card over the phone. Make checks payable to the EOU Trapshooting Club. Athletes may register the day of the event until 9:00 a.m. at the check-in table. Day-of registrants will be squadded in the final group. The EOU Trapshooting Club invites all participants, coaches and family members to take advantage of their visit to La Grande by taking part in a campus tour. The EOU Admissions Office will host special tours on Friday, March 15 at 1:30 and 3 p.m.
Tours will also be available Saturday during the shoot at 11:00 a.m.
Competition targets are included with the participation fee. All athletes will shoot 100 targets — 50 in each session — from the 16-yard line. Student-athletes will shoot an early session (Session 1), and again after the first session has completed (Session 2). Scoring disputes must be initiated by the student athlete only, and must be immediately after a scorer announces a lost target. Coaches may not be on the field while athletes are shooting. Coaches must remain on the sidewalk (if applicable) or a minimum of five yards behind the scorekeeper. Coaches may aid special-needs student-athletes that require assistance while shooting. Please use your high school average, ATA, PITA, WRITA, YESS, whichever is highest or a Coach’s Known Ability if none of the previous apply. All athletes will participate in the “High Gun” (highest number of targets hit) competitions. In the event of a tie, a shoot-off will occur. The athletes involved will draw a number to determine placement in a squad. All athletes will shoot a miss and out from the 16-yard line to determine a winner. Varsity level shooters will shoot off from the 20 yard line. The top five student-athlete scores from a team will be used to determine the overall team score. No squadding is required. If a tie-breaker is required for any places, the team member with the highest round score from each team will be used to break the tie. Subsequent score comparisons will be used if the top score is tied. There will not be a shoot-off to determine the winning team. Time and field assignments for teams and individuals will be emailed to all participants and coaches by March 14. Athletes will only be able to shoot during their team’s scheduled time on their team’s designated field(s). It is possible that final remaining members of a team may be combined with another partial team to create a full squad of participants to maximize time allotment. Teams should arrive at least one hour before their scheduled time to allow check-in, squadding and set-up. Teams will shoot in two sessions. After the starting time for the event, all starting and completion times are estimated. It is important to be prepared to shoot immediately after the previous team completes their round. All late registrants will be squadded to the final squads. Coaches/participants can make squadding requests by emailing jshorts@eou.edu prior to March 8. Athletes not on a full squad will be combined with other incomplete squads. If a student-athlete does not report to the assigned trap by the scheduled time, the student-athlete must be moved to the final squad. Scorekeepers will be provided by the EOU Trapshooting Program for the event. Event staff scoring decisions are final. Scores are recorded on the pre-squadded scoring sheet and tallied in the clubhouse. Scores will be posted on monitors if available and or club house display board. Scores are recounted by event officials to ensure accuracy. Mismarked or illegible scoring sheets are considered a ‘lost target’ by event staff. The only time a round score may be disputed is on the field immediately after a scorer has announced a lost target. All scores are final upon completion of the post. Patches will be awarded to those student-athletes that achieve 25, 50, 75 or 100 straight at the event. Event practice rounds are not eligible. Due to high participation levels, practice rounds will not be available on the day of the event. The La Grande Gun Club will be open Friday, March 16 from 2 to 7 p.m. for practice rounds. The cost for each practice round is $4.50. All participating athletes and their families can purchase an official event T-shirt. Pre-orders are strongly recommended as a limited supply of T-shirts will be available for purchase at the event. Shirts can be ordered for all participants on the registration form for $17.00 each. Shirt sizes available are adult unisex from Small to 2XL. Additional orders can be emailed to jshorts@eou.edu. Coaches are required to check in at the registration tables located in the clubhouse by 8 a.m. on the day of the event. Coaches will be given pre-ordered T-shirts for their team members at the check-in table. If you are registering as an individual, a parent or guardian can act as your coach and check in with event staff. Safety is our first priority for this event. The EOU Trapshooting Program will have Master Range Safety Officers (RSOs) at the event to oversee athlete and spectator safety. Everyone is expected to comply with all instructions received by the RSOs. In the event of a safety issue or concerns, notify a Master RSO. Master RSOs have final say in all safety matters. In the event of inclement weather before or during the tournament, EOU will make safety the first priority. If severe weather is forecast, and time permits, all participants will shoot a lesser number of targets as determined by the event committee. If time permits, all participants will shoot more targets until the prescribed number of targets has been shot. If weather does not permit completion of the shooting, the team with the highest score of the round(s) every shooter was able to complete, will be deemed the winner of that competition. We ask all participants and spectators to be dressed appropriately for all weather types. Please check local weather forecasts and come prepared to shoot in all weather conditions. Coaches should bring emergency contact information for all of their athletes for reference if needed. As there are many similar shotguns at events. To avoid lost or misplaced shotguns, we strongly suggest that student-athletes affix a label that includes the name, school team and contact information to their shotgun. The EOU Trapshooting Program and La Grande Gun Club will not be responsible for any missing firearms. All athletes are responsible for providing their own ammunition, which must adhere to gun club policies. Approved ammunition includes low base 7.5 or 8 target loads. Any and all spectators are welcome to attend the event. Team set-ups including tents and chairs are allowed BEHIND the field sidewalk. Free parking is available to all participants. The La Grande Gun Club offers limited RV spaces for participants. Electric hook-ups only, $20 a night. Food and non-alcoholic beverages can be brought to the event or purchased in the gun club and consumed in spectator areas. The EOU Trapshooting Club will be selling a variety of breakfast and lunch items on the day of the event. Alcohol consumption is not allowed by any athlete, coach, parent or spectator at any time during the event or awards ceremony. Friendly, obedient and socialized pets are permitted at the event. Pet owners who bring their pet do so at their own risk and agree to accept full responsibility for any physical damage or personal injury caused by the owner’s pet or to the pet while on event property. At all times, pets must be kept on a 6-foot or shorter leash while on event property. As a responsible pet owner, please clean up after your pet.